It seems like side-scrolling indie games are in, right now. 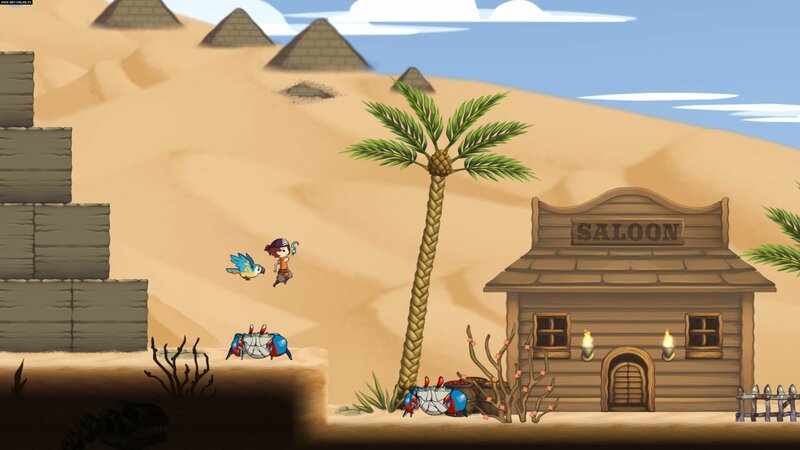 Treasure Adventure World is another side-scrolling platform adventure, with Metroidvania aspects and a bit of Spelunky in its art style. In its beautifully animated intro, we see a young boy accompanying an old man and an Indiana Jones-looking guy (now that I think about it, the old man has a bit of The Last Crusade’s Sean Connery about him) on various quests to find treasure. On the last one, a giant serpent rears up out of the sea and the Indiana double pulls out a sword and leaps, Captain Jack Sparrow style, into the mouth of the monster. Not sure why the mouth, to be honest, but hey ho. When the game begins proper, we are the little boy and we’ve basically been adopted by an elderly couple, after being washed up on their Island a little while back. Looks like Indy’s choice to jump into the mouth of a giant sea snake was a bad idea. Who knew? Our intrepid lad is also missing a hand and the local bully has stolen his hook hand, which later doubles as a melee weapon, so off we go to find it. After a couple of brief quests and encounters, we’re loaned a boat that can basically be pulled out of our pocket whenever we jump into water, so we can go sailing to other islands. It’s safe to say that Treasure Adventure World doesn’t skimp on the weirdness, but it’s endearing. Perhaps I should mention that a talking bird is our companion, too? He wakes us up one night and tells us that there are twelve Legendary Treasures hidden throughout the world’s islands and, well, why not trust a random talking bird and go sailing in a magical shrinking boat around the world? Like I said, this game is weird. The world itself is pretty big, chock full of quests, puzzles and dungeons; some you’ll be able to get through there and then, others you’ll return to later with new abilities or items. It can be a little difficult to tell where you’re supposed to be going at times, aside from strange pearls that reveal island locations on your map, and at least twice I found myself stumbling across my destination by virtue of just wandering off. Perhaps the intention is to simply encourage exploration, but I suspect it’s more down to the game needing a bit more direction. Traversing the various locales of the game is equal parts fun and frustrating, because while the levels are interesting and varied, the platforming mechanics are quite poor. Using the boy’s hook hand, you can latch onto metallic rings that hang on walls or dangle over pits, but often he just misses because the hit detection says you were a pixel off on your trajectory. Except you’re right on the bloody thing and it worked fine the last time. The actual physics are a bit odd too, as jumps often feel imprecise due to some inconsistent jump distances. It pulls you out of the fun, which is a shame because I quite enjoyed exploring the environments. The boss fights are interesting though, with an impressive emphasis on size. The first boss is a giant ooze monster that rises out of the sewage water below the first island, though quite how the inhabitants never knew about that is beyond me. I mean, it was basically the height of the screen and at least a dozen times the size our hero. This scale continues with the second boss, and the variety and creativity in their design and how to beat them, is marvelous. 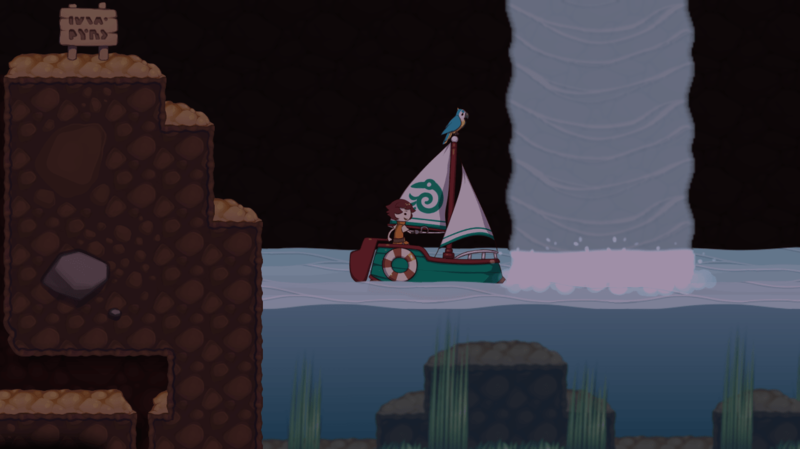 There’s a nice sense of adventure (funnily enough) in Treasure Adventure World, from sailing the seas in your magical boat, to speaking with the natives of each island (one is filled with talking mice and insects) and helping them to solve their problems; but it isn’t without some bugs. When the opening movie played, for example, there was a brief glimpse of a time bar along the bottom, like you were actually just streaming it from a website instead of it being part of the game. There was also a point when I first unlocked the boat and if I tried jumping whilst sailing, it would crash back to the desktop. Every single time. Very weird, but it did eventually fix itself, despite there being no update applied to either the game or my PC’s various drivers. With those issues fixed and the platforming smoothed out a little, I could see this being a fun time.